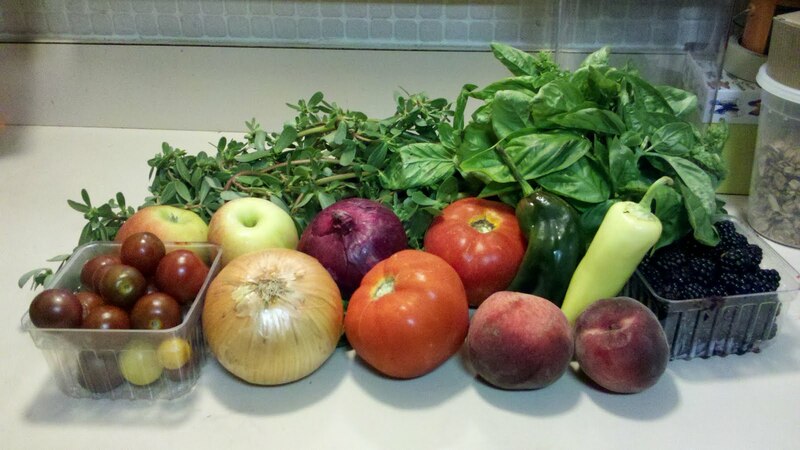 Rooted Practice: Random Friday Facts - Food Edition! 1. I don't generally pay attention to expiration dates; if it looks and smells fine, I eat it. If not, I toss it. 2. My favorite Thai comfort food is called ba mee moo dang. It's egg noodles with barbecued pork. (You can get it as a soup version, but I prefer it "hang"--or dry.) I can get it all over the place in NY, but none of the 8 zillion Thai restaurants in Northern Virginia have it--and I haven't quite figured out how to make the roast pork just right, so my version isn't quite the same. 3. 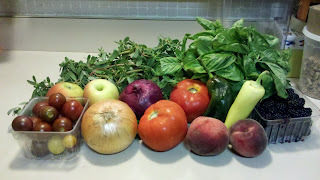 Sometimes I buy things at the farmer's market because I have no idea what they are and how they should be used. (That said, I usually Google them on my phone to get an idea before I actually purchase them. See that bushy green stuff in the back left side of the photo? It's called purslane and I'd never heard of it before last week. 4. The two best meals I've ever eaten were at Graham Elliot in Chicago and The Joshua Wilton House in Harrisonburg, VA. A close second (third?) was Frontera Grill (also in Chicago.) Other favorites have included Acquerello in San Francisco, and Rasika, Cafe Atlantico (currently closed), 1789, and 2941 in DC. 5. I like my steak rare. As in "scare the cow with a match" or "walk the cow through a warm room" kind of rare. 6. Cilantro is my favorite herb. I use it all the time, and I roll my R's when I say it. 7. I never used to eat wheat bread, but I've come to enjoy (and perhaps even prefer) it. But still love my Sunbeam sandwich bread every once in a while! 9. Like most foodies in DC, I'm dying to eat at minibar. 10. I used to say I'd never eat any kind of meat that wasn't readily found in a grocery store... but the more "into" food I get, the less I care. I ate wild boar a couple of weeks ago and enjoyed it.